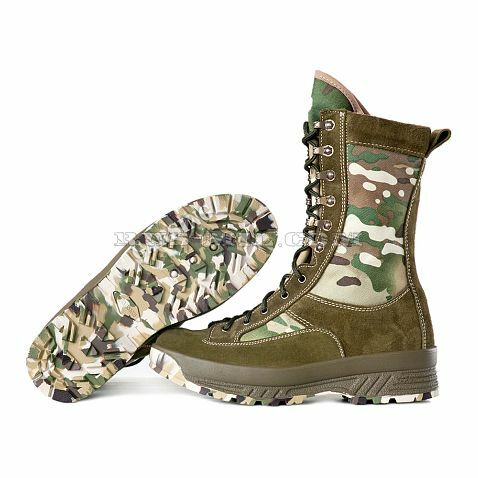 The boots are made using modern technologies and taking into account the wishes of the military specialists who conducted the test wear of these boots in the highland regions of Kazakhstan. The sole in this model is made of rubber in combination with polyurethane foam, in order to reduce weight and improve shock absorption. Bottom of rubber and an intermediate layer of foamed polyurethane. Soles with such a combination of layers of rubber and PU include the best aspects and characteristics of the above materials: a running layer is made of rubber, and a shock-absorbing layer is made of PU. An additional property of polyurethane is its low thermal conductivity, which makes it possible to ensure that the foot does not freeze in the cold, and does not "burn" in the heat. 980 MO "STORM CAMO MULTI" have woven inserts of high-strength nylon material in order to make this model easier.